Mothers, retirees, veterans, scientists, and working-class Americans sent letters by the dozens over several months to the commission formed this year by Donald Trump to help solve the opioid crisis. One concern united them: Tight restrictions on prescription pills could be driving pain patients to turn to heroin and fentanyl. And yet, 25 of the 56 recommendations included in the commission’s final report, released last week, call for a continued crackdown on prescription opioids and other “supply reduction and enforcement strategies.” At the same time, the report acknowledged that these policies likely contributed to the massive spike in fatal overdoses in recent years. It’s as if the commission, led by New Jersey Gov. Chris Christie, believes Trump can double down on an approach that made the problem worse and it will somehow produce a different result. American pharmacies still dispense three times as many opioids as they did in 1999, but prescribing rates have been falling steadily since 2011, due in large part to CDC guidelines that discourage primary care doctors from putting patients on opioids for pain that lasts longer than three months. Even so, government officials remain fixated on painkillers. At least 17 states have limited doses or prescription durations. Attorney General Jeff Sessions also created a special Department of Justice unit to investigate doctors and pharmacists suspected of illegally dispensing painkillers. It’s true that a glut of powerful painkillers flooding the market helped trigger the opioid epidemic, but the latest data — including stats cited by Christie’s commission — show that the problem has since metastasized. The commission’s report includes a remarkable section under the heading “lack of foresight of unintended consequences,” which notes that as painkillers became more scarce, “market forces responded” by supplying cheap, powerful, and deadly synthetic opioids like fentanyl. Heroin and fentanyl now account for more than half of the overdose deaths in 10 states, according to the Centers for Disease Control and Prevention. The 2016 National Survey on Drug Use and Health found that 62 percent of adults who misused opioids did so without a prescription, and 40 percent obtained painkillers from friends or relatives, not a doctor. Another study from earlier this year found that heroin now appears to be the most common type of opioid tried by first-time users. The letters sent to Trump’s commission, obtained by VICE News using the Freedom of Information Act, reveal the desperate situations pain patients find themselves in when they abruptly lose access to medication. For doctors like Kertesz, the situation is maddening. He hears about suicides on a near-weekly basis by patients who have lost access to painkillers, and he says recent anti-opioid prescription policies have “incentivized abandonment” of pain patients. Kertesz has asked the CDC to investigate deaths linked to pain patients losing access to medicine, and he wants policymakers to recognize that the solution to the opioid epidemic is more complex than just reducing the supply of painkillers. A CDC spokesperson acknowledged that chronic pain can increase the likelihood of suicide but that additional research is necessary. Still, the organization aims to “ensure patients have access to safer, more effective treatment individualized to their circumstances,” the spokesperson said. “Clinicians have a responsibility to carefully manage opioid therapy and not abandon patients in chronic pain.” The CDC also noted that heroin use is increasing everywhere, not just areas where opioid prescriptions are decreasing. Among those trying to make the case that the prescription opioid clampdown is claiming lives — not saving them — is Joel Bomgar, a state representative from Mississippi and vice chairman of his Legislature’s Medicaid committee. According to his analysis of CDC data, pill restrictions caused the rate of prescription opioid overdose deaths to fall while fatalities caused by illicit opioid have skyrocketed. Even among independent experts, there’s no consensus about how exactly the crackdown on prescription opioids is linked to the surge in deaths from fentanyl and heroin. Caleb Alexander, co-director of the Center for Drug Safety and Effectiveness at the Johns Hopkins Bloomberg School of Public Health, believes there’s “a complex, nuanced relationship” between painkiller restrictions and fatal overdoses. The dramatic rise in opioid prescriptions can be traced back to 1996, when the American Pain Society launched its influential “fifth vital sign” campaign, which urged doctors to ask patients about pain in addition to checking their blood pressure, pulse, body temperature, and rate of breathing. 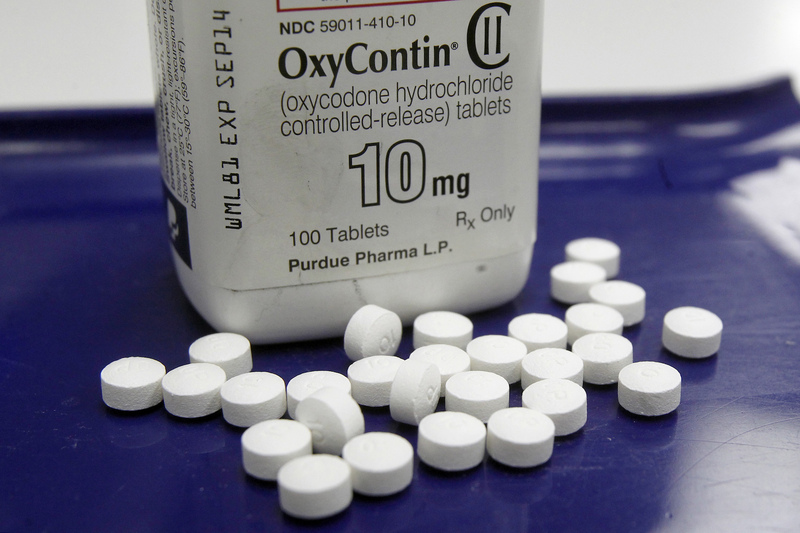 OxyContin debuted that same year, and manufacturer Purdue Pharma starting marketing the powerful pills to doctors as a relatively safe option for pain patients. In its final report, the opioid commission called for the Centers for Medicare and Medicaid Services to eliminate questions about pain levels from patient satisfaction surveys, but it didn’t stop there. The commission also recommends new training and oversight for opioid prescribers and pharmacists and increase access to addiction treatment but asks Trump to back legislation that would require states to comply with regulations for prescription drug monitoring programs to receive grant money and share prescription data with the Justice Department. In addition to the dozens of pain patients who wrote in to the commission clearly hoping for a better solution, doctors and public health experts also pleaded for a new approach. In one letter, Elizabeth Salisbury-Afshar, a medical director of behavioral health at the Chicago Department of Public Health, warned about the overemphasis on prescription drugs. She noted that painkillers caused only 8 percent of the overdose deaths in the city. The rest were due to fentanyl and heroin.